Subscribe to comments with RSS or TrackBack to ' Atlantis VSTi beta 0.9j '. Good to see the website back up again! - the env attacks/decays/releases are linear, which is good for pitch modulations, but not for amp and cutoff modulations, etc, it just sounds unnatuaral no matter what. could you maybe implement a “curve” parameter, so that one can shape the curve from inverse exponential over linear to exponential for the attacks/decays/releases? maybe with a modifier-rightclick directly on the line between 2 nodes? 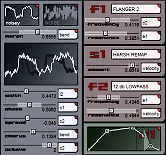 - the modulation of parameters is _always_ bipolar, which might be cool for lfo´s, but definately not for cc´s and env´s. could you maybe add an option for the modulation to be unipolar, when needed? again, maybe with a modifier key > drag, so that the endpoint of the parameter modulation is the target value, and the ammount is the startvalue? - when using the midi-1 modulator (cc1/modwheel), some parameters have audible jitternoise/steps, which makes it impossible to use it. could you maybe add either a useradjustable lag parameter or add some kind of interpolation, so that these noises don´t occour? however, should you not want to do this, just ignore my comments. have a nice time, and thank you again!